How rich would you be if everyone had the same income? This post will attempt to work out, via some very rough back-of-the-envelope calculations, how rich an individual would be if everyone in the world had the same income. Incidentally, this is not meant to be a response to any particular argument; to my knowledge, nobody is currently advocating that the world's income be redistributed equally among its citizens. According to the CIA World Factbook, the GWP in 2013 was $87.18 trillion. Since the global population in 2013 was 7.1 billion, the GWP per capita was approximately $12,300. In comparison, the current GDP per capita of the UK is about $37,300. Therefore, if the world continued to produce $87.18 trillion in output under a regime of global income redistribution, the average person in the UK would be about 67% poorer. However, because the UK's income distribution is skewed, the typical (i.e., median) person would only be about 37% poorer. Note that $12,300 is a pre-tax figure. Funding a government that spent 40% of GDP would leave an individual with about $7,400 in disposable income. The second column of the table gives the year at which the UK had the same income, based on data from the Maddison project. (Estimates were converted to 1990 dollars prior to comparison with the Maddison numbers). The third column gives the percentile of the current UK income distribution that each estimate corresponds to. The fourth column gives the percentile of the current world income distribution that each estimate corresponds to, based on the Global Rich List calculator. And the final column gives a country that currently has the same income. If global income redistribution yielded an income per person of $12,300, an individual would enjoy the average living standard of: the UK in 1954, someone at the 23rd percentile of the UK income distribution, someone at the 87th percentile of the world income distribution, or Brazil. Comparatively, if global income redistribution yielded an income per person of only $1,200, an individual would enjoy the average living standard of: the UK in 1300, someone at less than the 1st percentile of the UK income distribution, someone at the 48th percentile of the world income distribution, or Eritrea. Could China and Russia defeat their neighbours' combined military forces? Both China and Russia's recent military activities have received considerable media attention: the former, in regard to territorial disputes with Japan, Vietnam, and the Philippines; and the latter, with respect to the annexation of Crimea following a referendum on March 16. This post presents an extremely rough analysis of the relative military might of China and its neighbours, and of Russia and its neighbours. The data are on total military spending in 2012, taken from the SIPRI. 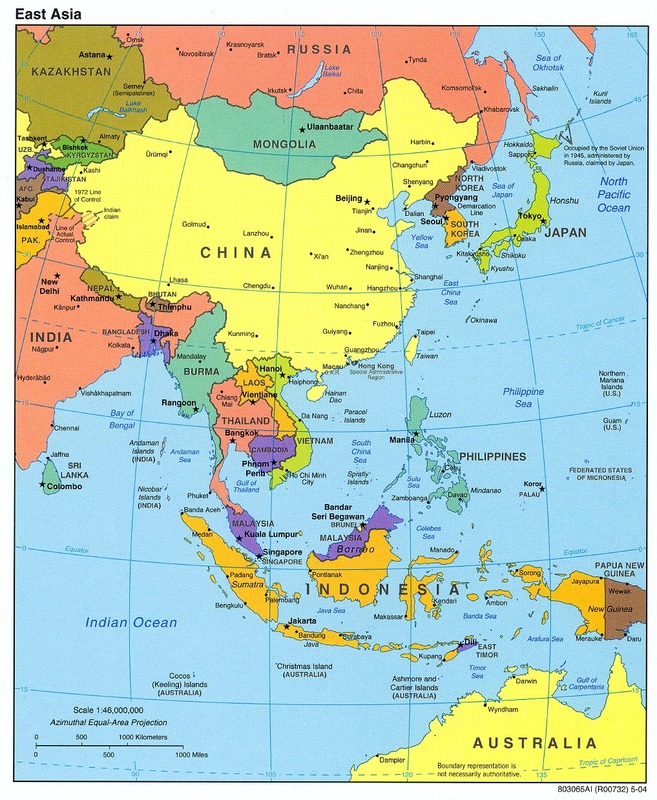 In the case of China, I count as neighbours all those countries with which China could plausibly have a territorial dispute in either the East China Sea or the South China Sea. By my reckoning, that means: South Korea, Japan, Taiwan, Indonesia, Malaysia, Brunei, Singapore and Vietnam. I refer to these countries as China's 'Eastern and South Eastern neighbours'. In the case of Russia, I count as neighbours all those countries included in The Economist's satirical map of Russia's "greater linguistic empire". That is: Estonia, Latvia, Lithuania, Belarus, Ukraine, Moldova, Georgia, Armenia, Azerbaijan, Kazakstan, Uzbekistan, Turkmenistan, Kyrgyzstan and Tajikistan. I refer to these countries as Russia's 'Western and South Western neighbours'. 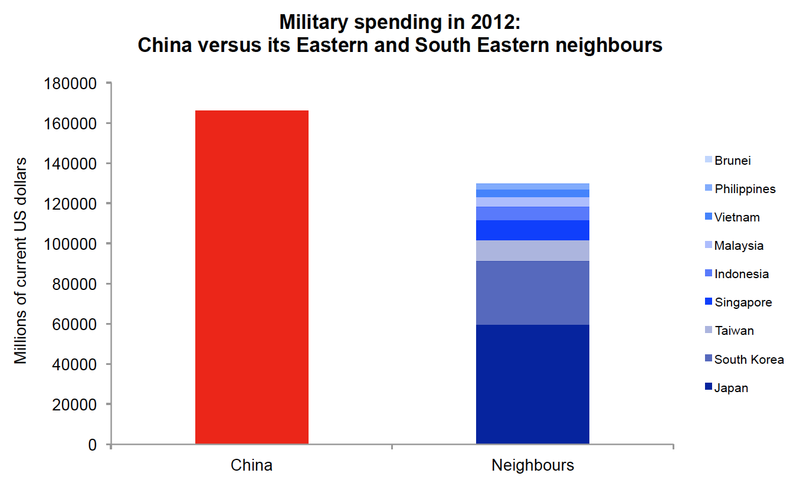 The first chart plots military spending for China versus its Eastern and South Eastern neighbours. In total, China's spending is about 28% higher than that of its neighbours. Thus, in the extremely unlikely event of a war in which all of China's Eastern and South Eastern neighbours united against it, the odds would be tipped slightly in China's favour. 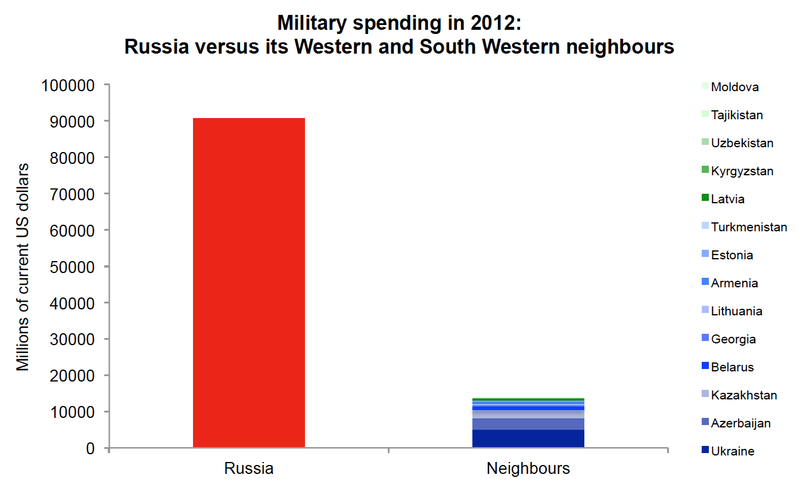 The second chart plots military spending for Russia versus its Western and South Western neighbours. Overall, Russia's spending is approximately 550% greater than that of its neighbours. Therefore, in the extremely unlikely event of a war in which all of Russia's Western and South Western neighbours united against it, the odds would be stacked dramatically in Russia's favour. There are a number of reasons why the comparisons here are somewhat absurd. First, military spending in 2012 may not be an especially good measure of a country's military force. For instance, it does not take into account large military investments (e.g., missile silos) made in previous years. Second, many of the neighbouring countries (e.g., Latvia, Lithuania, Japan) have signed "mutual" defence treaties with much more powerful nations, notably the United States. Third, several of the countries included among Russia's neighbours (e.g., Belarus, Kazakhstan) are in fact relatively close military allies of Russia. Is vacancy on the rise in London? There has been much discussion in the media recently concerning the number of vacant houses in London. The Daily Mail reports that "Only two thirds of London property buyers intend to live and work in London, which has led to hundreds of unoccupied properties." The New York Times contends that an influx of foreign buyers "has made parts of London more international, more expensive and more empty." Similarly, the London Evening Standard notes that, in the London borough of Chelsea and Kensington, there has been a dramatic increase in the number of unoccupied properties since 2012. On the other hand, Allister Heath at City A.M. is skeptical, arguing that the situation has been getting better not worse. In this post, I will examine the situation myself, using data from the Department of Communities and Local Government. 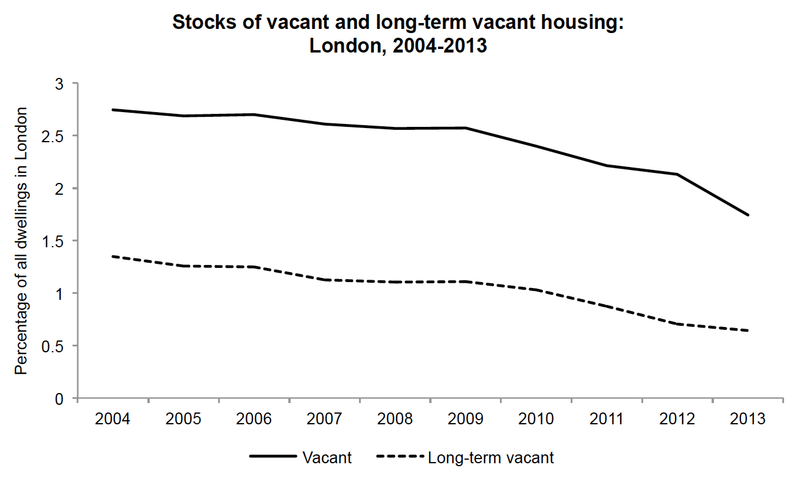 The first chart plots the proportion of vacant and long-term vacant dwellings in London between 2004 and 2013. Long-term vacant dwellings are those that have been unoccupied and substantially unfurnished for more than 6 months. Consistent with Heath, the stocks of both vacant and long-term vacant dwellings have declined monotonically since 2004; the decline in the stock of vacant dwellings appears to have been particularly rapid since 2009. Do we see the same trend for Chelsea and Kensington in particular? 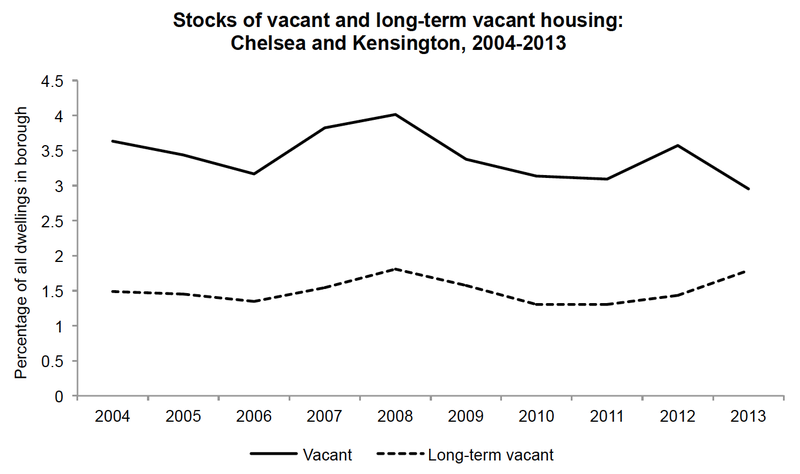 The second chart plots the proportion of vacant and long-term vacant dwellings in Chelsea and Kensington. Consistent with the Standard, the stock of long-term vacant dwellings has increased since 2010. However, there doesn't seem to be any evidence of runaway vacancy. The stock of vacant dwellings is in fact at its lowest point since 2004. A possible caveat is that the properties which have recently gone unoccupied for more than six months are larger than average, meaning that if vacancy were plotted as a percentage of total square-footage in the borough, the upward trend since 2010 would be steeper. A couple of notes on methodology: the numbers on vacancy don't go back further than 2004, and the charts look more-or-less identical if absolute numbers are plotted rather than percentages. 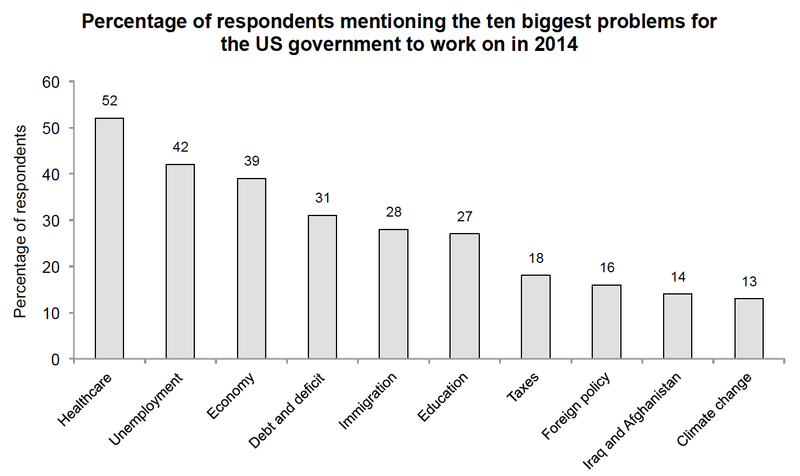 What are the biggest problems for the US government to work on in 2014? The National Opinion Research Centre, in conjunction with the Associated Press, recently published the results of an opinion poll on problems facing the United States. (Thanks to Simon Wan for drawing my attention to the poll.) Approximately 1,400 American adults were interviewed in December of 2013. The first question they were asked was, "Generally speaking, would you say things in this country are heading in the right direction or the wrong direction?". 63% of respondents answered "wrong direction". This group presumably comprises some people who feel the Obama administration has been doing too much as well as some who feel it has not been doing enough. The second question respondents were asked was, "Thinking about the problems facing the United States and the world today, which problems would you like the government to be working on in 2014?" Respondents were able to list up to ten specific problems. 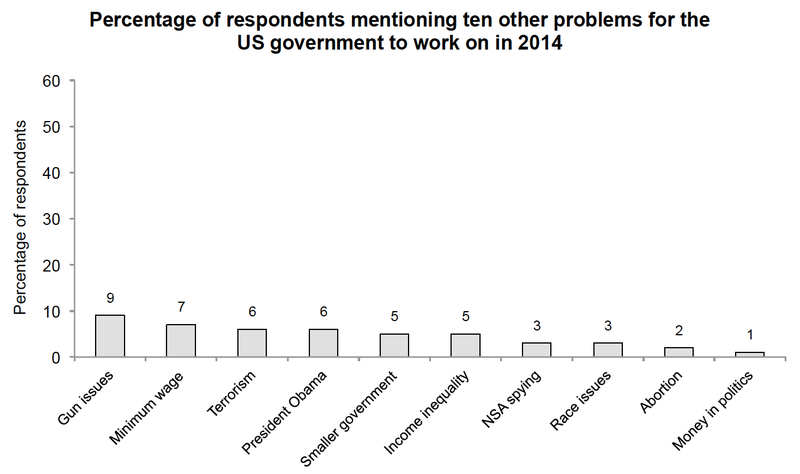 The first chart displays the proportion of respondents mentioning each of the ten most-mentioned problems. "Healthcare" was the most-mentioned problem of all, having been cited by 52% of respondents. "Unemployment" and the "Economy" were the next most-mentioned problems, having been cited by 42% and 39% of respondents, respectively. The second chart displays the proportion of respondents mentioning ten other problems, each of which was mentioned by surprisingly few respondents (in my opinion). Only 6% of respondents cited "Terrorism", only 5% cited "Smaller government", only 5% cited "Income inequality", only 3% cited "NSA spying", and only 1% cited "Money in politics". These results suggest that neither the Occupy Wall Street movement, with its emphasis on big corporations and income inequality, nor the Tea Party movement, with its emphasis on cronyism and smaller government, is particularly representative of the American people. However, it could be argued that the relatively large number of respondents citing "Healthcare", "Debt and deficit" and "Immigration" implies that the Tea Party is at least somewhat representative.